Unusually warm sunshine for the end of October began our week. My eldest daughter and I enjoy birthdays just two days apart and we try to go out for coffee or lunch together during this time. This year, we went to Butchart Gardens for a walk and then enjoyed scones and tea in the coffee shop. I wondered if we would see any dahlias. Yes, indeed. They were still their in all their glowing colour. We were just in time, though, for I noted a wheelbarrow filled with cut plants and tubers. The lifting out has begun. Dahlias are so varied. It's almost the end of the fall flowers now and we watched gardeners planting bucket fulls of spring bulbs. One gardener threw them over the beds, letting them fall where they may, while others followed and dug the bulbs in with long-handled tools. I planted bulbs in my own garden last Saturday. What a hopeful thing it is to place dry brown bits into the ground, and cover them up, trusting that they will transform into beautiful flowers in a few months. First, however, they, and we, must pass the winter season. We had an unexpectedly early taste of winter this week, too. The temperature dropped to below freezing and the snow began to fall. I was glad to spend time drinking tea while toasting myself by the fire. Today the sun returned, but the temperature continues low. A good day to bake a cake and use the copper beating bowl Tim gave me for my birthday. In an odd bit of happy coincidence, my youngest daughter gave me a set of copper measuring spoons. The two givers didn't consult each other, nor had I mentioned a desire for copper items. I baked a pumpkin chiffon cake and it turned out well, light and airy with a delicate pumpkin flavour. I put the recipe on my other blog. Here's a link. Copper is supposed to give egg whites an edge on beating up. Sunshine to snow to rain and back to sunshine. What will this week hold? So amazing how the weather can change so quickly. Those dahlias are just gorgeous. Belated birthday wishes for you both. Oh the flowers are lovely, I always enjoy your trips to the gardens. And what lovely gifts, and coordinated too. Your cake sounds delicious. We had 5 inches of snow on Thursday night - most of the rest of the city and county got far less, our house is at the peak of a small hill and we seem to have our own mini climate that is much colder than even those less than a block away. Today it has almost all melted, except in our yard. Some melted but not much - and some we pushed off the deck with a broom so that it could melt faster. I hope this next week gives us more melting weather. Happy week ahead - and happy belated birthday my dear. What a lovely colourful and cheerful post - we are experiencing some very late Autumn colour this year too. The copper bowl and measuring spoons are lovely. Lovely photos. 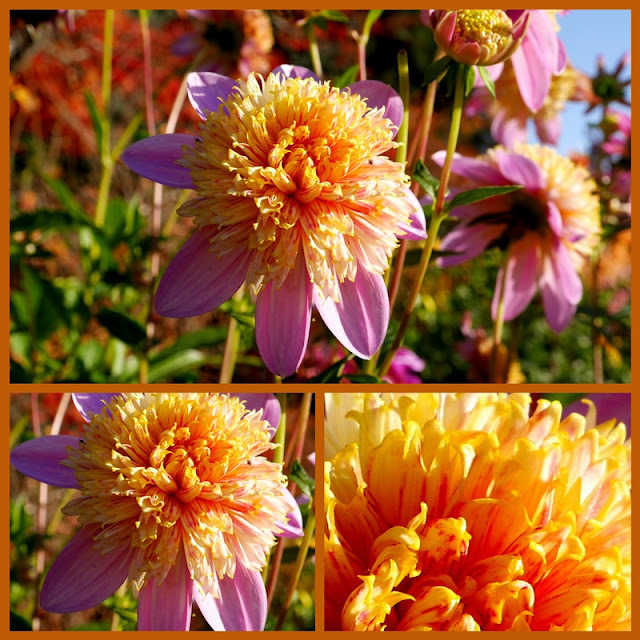 The pink and peach dahlias are gorgeous! Those flowers are so pretty. Your cake sounds wonderful too! I want to plant bulbs, but my new home's garden and yard are still at the dirt stage. I have some copper measuring spoons, too. I love your bowl! Great size! I love what you said about the bulbs. Its so true. Hopeful! A great variety. That's interesting about copper and egg whites. The dahlias are so pretty. Happy week to you! Belated Happy Birthday! A visit to Butchart Gardens is always a treat. I'm happy to see that the dahlias didn't disappoint and brightened up the day for you even more We too have been enjoying afternoon tea by the log burner this past few days, although bright and sunny there is still a nip in the air as the days draw to a close. What contrasts! And I alway love seeing your cup with the handwriting on it. Your husband is really up with the times--its nice seeing copper make a "come back"-- so pretty. I think I'll check out your recipe! The copper is so pretty. I was wearing a copper colored necklace when I bought a copper chain at the craft sale. It's funny when you have coincidences like that...and very nice! Hope you have sunshine this week! Hugs! Times are looking warm and cozy at your house, no matter what's going on outside your door! How serendipitous, those copper cooking items from your dear ones! A lover of all things pumpkin, I am on my way to peek at that cake recipe . . .
That cake looks amazing! Love the copper bowl and spoons. Oh dahlias, how I would love seeing them in that garden. 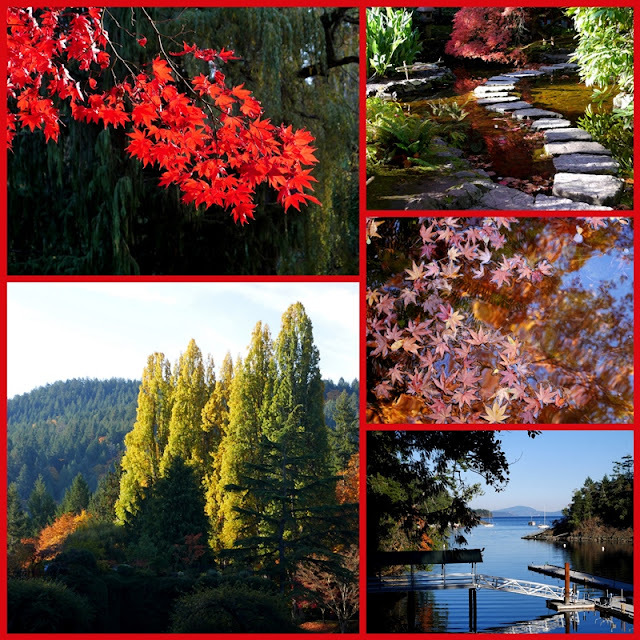 I immediately knew you were at Butchart Gardens when I saw the first collage with the water view. I love that view.What a wonderful garden to be able to visit often. The dahlias are fabulous,stunning colours! Love the cake it looks scrumptious! 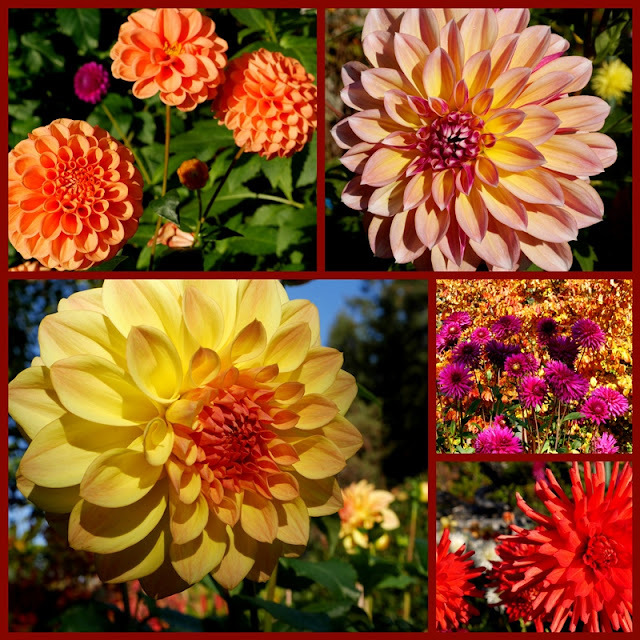 Dahlias in different hues and forms are so beautiful. Your pumpkin chiffon cake glazed with icing sugar reminded me of the dusting of snow on the ground. In my part of the world, dahlias start blooming in July and are at their best in October and it’s getting cold with each rain now in November. Happy Belated Birthday, Lori. The copper beating bow is a beautiful addition to the kitchen. The cake looks pretty yummy too. We have snow today. About and inch already. Typical for the season. I love the snow--when I don't have to to you. And I do today. I hope your day is filled with sunshine. I didn't know that about copper and egg whites. My daughter made a chiffon cake for the fair and it went to state and got a special mention there too! She used our electric mixer...you must have a strong arm!! Beautiful! We've been to Butchart Gardens in mid-summer a couple of times and at Christmas one year for the lights... how I'd love to be there in Autumn sometime. The cake looks delicious .... I did not know that about copper ... that is a beautiful bowl!! Lorrie - belated happy birthday! In the first mosaic, my eye was drawn to the stepping stones and the Japanese maple since both are elements we plan to build into the landscape at our new house. And then the dahlias - since we are into winter already, it was delight and an amazement that somewhere north of here these are still blooming. Gorgeous. I am going to keep your recipe ... lately I have been going to a friend's house to knit with her and I always like to take a little bit of something sweet - this will do nicely. Enjoy your week. Happy belated birthday to you and your daughter! What fun it must have been to find two presents made from copper, and how intriguing to know that neither your daughter nor your hubby consulted one another. 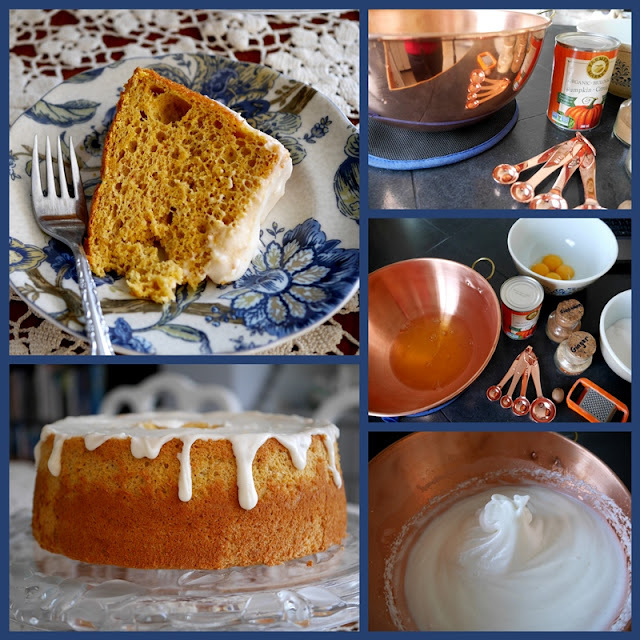 Your pumpkin chiffon cake looks and sounds delicious. I think I'd be the first gardener you spotted at Butchart Gardens, the one nonchalantly tossing the bulbs onto the soil, excited to see what pretties will pop up where in the spring. The mosaic of the dahlias is beautiful. All beautiful but Ilove the stepping stones. Wonderful mosaics. The fall colors were lovely and the flowers so beautiful. I also want a slice of that yummy looking cake. Oh Lorrie this is a fabulous post. Your photographs are wonderful and I love all the colour in them.